You don't exactly have to be "in the know" around London to have seen this restaurant around. 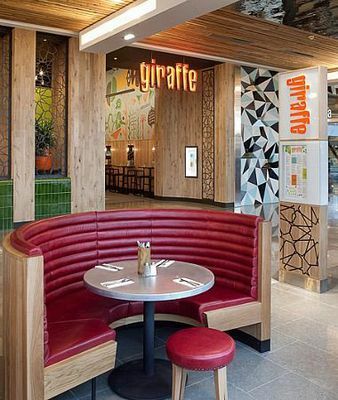 Giraffe has 43 restaurants in the UK and 20 of those are in London, including prime locations in Central London such as Embankment Pier, King's Cross, Spitalfields, and Soho. Although Giraffe may not offer the family-run, individualistic and unique dining experience that make up many of London's best, it does provide a reliably tasty and relatively affordable night out that is a safe bet for foodies all over the UK. With a large menu that includes breakfast, brunch, cheap lunch deals, dinner, and dessert, Giraffe aims to please customers all day, every day. For meat eaters, I've been told that when looking for a "real" hamburger, Giraffe is the best place to go. For vegetarians like me, Giraffe has plenty of meat-free meals-- their Farmers Market Vegetable Burrito, Phod Malay Udon Noodles, Falafel "Deluxe" Burger, and Jambalaya Risotto were a few of their more interesting vegetarian options. The menu items vary in price, with most main courses at dinnertime ranging between £8.95 to £15.50, but be prepared to spend more - if you can make it through dinner without indulging in some of their enticing starters, creative cocktails, or delicious desserts, you're a stronger person than I am. It's easy to want the full experience at Giraffe, with their dependably good food and cool, enjoyable atmosphere. Next time you are out and looking for a guaranteed satisfying meal, don't overlook this popular chain restaurant. To find your nearest Giraffe, check out their full menu, or look up their special deals and discounts, visit Giraffe's website by clicking here. Why? A reliably tasty experience all over London.